 These allegorical stories from a Chinese master delight with spare language and wry hidden meanings. 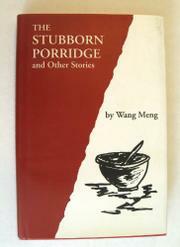 In ``The Stubborn Porridge,'' a man describes the battle within his family over food. Disagreements lead to voting, and eventually to hot discussions of whether their housekeeper, a woman who has served them for 40 years and whom they address as ``Elder Sister Xu,'' should have the same rights as her employers. ``The Wind on the Plateau'' follows the ups and downs of a family after it receives a new apartment. ``A Winter's Topic'' depicts Zhu Shendu, an expert on bathing and the author of a tome titled Introduction to Bathing, which brings him first fame, then trouble when a colleague challenges him by stating that Canadians wash themselves in the morning. In ``Fine Tuning,'' a couple run through various emotions after purchasing a television. First they adore it, then they become critical, and eventually adjusting its antenna and attempting to achieve perfect reception become more important than actually watching the programs available. Wang observes, ``The two of them almost ended in divorce over the TV. The two of them became inseparable over the fine tuning.'' The narrator of ``The Blinking of the Bell,'' a poet, recounts his struggles with a telephone, which seems indispensable until its interruptions become unbearable. ``Thrilling'' and ``Capriccio Ö Xiang Ming,'' which was written in response to an irritated letter about the former, use a stream-of-consciousness style to relate the adventures of Xiang Ming, a man suffering from ``a cervical vertebra problem which means spine problem dental carries dysentery vitiligo breast cancer as well a clean bill of health and assurance of longevity.'' While the narrative in these two selections is not always clear, Wang's playfulness with language is. Although it doesn't have much staying power, this is a thoroughly enjoyable group of stories that tweaks bureaucracy and turns expectations around.